It was summer which for me meant playing softball non-stop. I was sitting in the dugout, sweat running down my back, cheering on a teammate as she was up to bat. The team mom had wandered into the dugout to pass out drinks or gum or whatever it is that team moms do during games. I don’t remember how the conversation turned to bodies but it did. Then she proceeded to show us what she meant. And this woman, this team mom, this mother of an impressionable middle school girl, showed us her tanned, skinny legs and how they made what was supposed to be the ideal way to look. I remember the shame I felt as she showed us what we were “supposed” to look like. I remember turning away and pretending like I wasn’t a part of the conversation, wasn’t listening, so no one would have to know I knew what I was supposed to look like and that I didn’t look like I was supposed to. Now as an adult, I don’t feel shame. I feel anger at that woman whose name I still remember and whose house I still drive by occasionally. How dare she tell young teenage girls what their bodies should look like. What we were supposed to be able to do. There was no mention of genetics or body types or being fit and healthy. I was supposed to have diamonds between my legs. I was supposed to look like her. I physically can’t make any part of my calves touch. Standing completely straight, feet together, my calves are no where close to each other. It’s not because of some body malfunction (although I am quite pigeon-toed so my legs turn slightly when I stand), but because my body wasn’t made to touch there. It doesn’t mean there’s something wrong with me. When I stand with my feet together, my knees knock into each other, there is a gap right above them and then my thighs meet. I have a diamond in a spot she didn’t mention! Is something wrong with me?! I will never be able to stand with my feet together and have those diamonds she preached about on that hot July day. And it wasn’t just that I felt bad about myself because I was bigger (taller, heavier) than everyone else, it’s that I can recall some of the other girls on my team and know they heard what she said, too. And their bodies didn’t fit that criteria, either. One of my softball friends was stick-thin. There was no part on her body that was ever going to touch. If I could see her today, I’d probably still be hard-pressed to find a curve on her body. And I’m going out on a limb here, but I bet that she wished some part of her legs would touch, that she could have some curves and shape and some diamonds, too. How dare that woman get into our heads. How dare that woman tell us how we should look. Who is she to stand next to a bunch of girls who were strong and athletic and powerful and just learning about ourselves and tell us how we were supposed to be? Now I know that this woman’s body issues were deep. That to stand in front of a dugout full of almost-teenage girls and tell us something like that speaks volumes about how she feels about her own body, what warped sense of being she has, and what consumes her. I feel sorry for her now. Sorry for her life that was focused on the wrong things. Sorry that she felt the need to tell a bunch of impressionable little girls her way was right and that we–and our beautiful bodies–were wrong. I just hope all the other little girls on the ball field that day have finally learned that she was wrong, too. I have the opposite problem as you. My entire life, I’ve had big calves. Not absurdly big, and they’ve almost always looks very athletic. But it’s always been something I loved and hated. I remember being at softball practice (what is it about softball, man?!). I was up to bat, and I heard a mother talking to my own saying, “Does Kate work out her calves? How does she get them to look like that? !” In a way, I took it as a compliment. I didn’t even have to TRY, yet my calves looked nice. But at the same time, it made me feel like a freak. Why WERE my calves so much bigger than everyone else’s? It just breaks my heart that we are basically told by the world that we are ALL supposed to look a certain way. Sigh. I know, right? It’s such a dangerous thing to be told by adults something is wrong (or even right!) with our bodies. Hoping for a better world for my daughters. Well crap, my legs touch from ankle to thigh! Seriously, I just tried it. And, I wish you had the mind to tell that mom the only diamond you cared about was the one that you were playing ball on! I can’t even imagine the damage that could have caused a teenage girl that may have already been insecure about her body. This is a terrible, heart-wrenching story. As a mother I can remember you and my daughter being best friends in elementary and high school. I also remember you and her as being the tallest girls in class. Maybe that is why you two are still good friends… your mother and I never paid much attention to what people thought you should be at that time and we focused on the beautiful women you have become today. It is not is you have a perfect heart shaped face, three diamonds between your legs, a cheerleader or the most popular girl in the class… it is what you have in your heart that makes you the perfect girl, the person one always wants to be around, the smile and attitude you leave on another life. The difference you make and self values you leave to another is what is of real importance. Besides those diamonds… they should be on your hand girl friend!!!! lol Love Ya Lots! Thanks, Peggy! You’re so right, wish I could have known that truth when I was younger. This made me tear up! As a mother of two young girls, I battle daily to un-stick things about their thighs or tummy area that other little girls in their class have said. They certainly don’t need the pressure of another mother! Raising a girl is so hard (I’m sure boys are no easier!) and as a mom who struggles with her weight and eating it’s even harder to make sure what is going on in my mind doesn’t sneak through my lips. And I so needed this right now. My eldest daughter is tiny. Has been all her life. Below the 5% and on her own growth curve. She reaching the age where puberty is going to start (and has in some of her friends). Her doctor is concerned and I am learning a few things that I never thought about. They approached me about growth hormone. It’s so hard to make the right decision and stand up for what you believe and still make your daughter feel like her body is okay, That there is nothing wrong with it. It’s amazing what sticks in your brain for years and years. I hope that woman eventually found some peace and happiness with her own body. Why is parenting so hard?? A million choices and you just pray you’re making the right choice. My mom has told me countless times that she always hoped she was making the right choice and if she didn’t, that her kids would at least see why she made that choice later on. I’m praying for the choices you have to make and I know that you’ll make informed, good choices in the best interest of your precious child. I think that’s interesting, I know that’s a trend on fitness boards on pinterest to have the “thigh gap.” It’s not only ridiculous but also unrealistic. 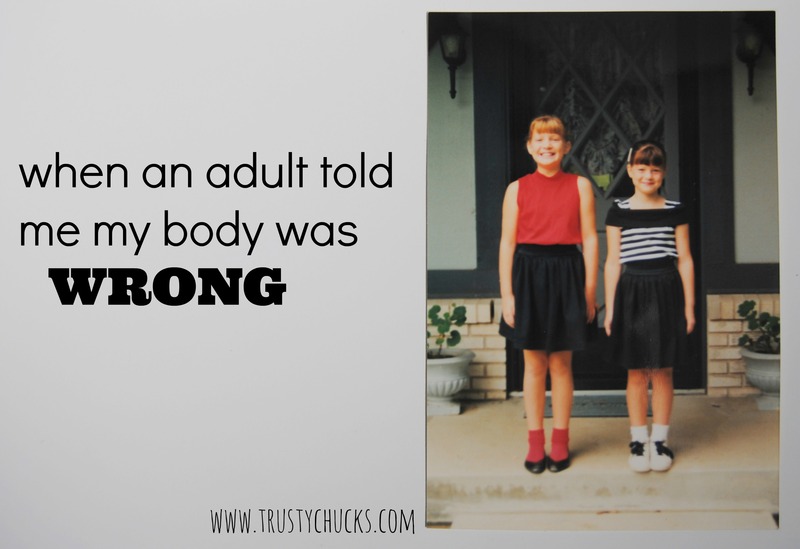 I’m almost twenty one and have had issues with my body for years (then again which girl doesn’t?) but according to this women’s standards something’s “wrong” because my ankles physically can’t touch. I never noticed it before, well not until now. I never want my girls to have to deal with that, because even though I don’t know them, and haven’t had them yet I know that if I do, they will be beautiful. Because all girls are. 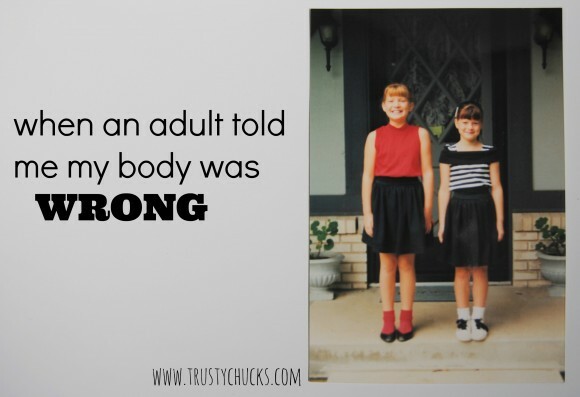 When I was in the third grade I overheard a teacher talking about my weight….I already knew I was heavier than most girls my age and felt bad enough about it…..
now at 42, I am still struggling to accept my body! Diane: I’m sorry that a damaged adult passed on their issues to you. To think of you overhearing that as a child breaks my heart. I’m praying for you.